Winter Hair Protection - Intensely Conditioning Argan Oil with Ylang Ylang - Amphora Aromatics Ltd – Supplier of pure essential oils and aromatherapy Products. Struggling to control your Static Hair during this colder weather? Try this intensely conditioning anti-static all-natural blend. Click for full details. These cold, dry days with little or no moisture in the air can lead to many problems – things like Static Hair can be a real issue during winter. This can make it really difficult to control and style your hair. The main cause of this is simply the lack of humidity in our environment. This is the case for both outside and inside. Indoors there is often central heating on. This combined with hot showers, hairdryers and straighteners is a recipe for disaster for hair that is prone to static. One of the best ways of treating Static Hair is to lock in moisture through intensive conditioning. Conventional conditioners often contain harsh chemicals which moisturise your hair in an abrasive and sometimes toxic manner. They can leave your hair feeling and looking worse in the long run. For a natural alternative, look no further than the abundance of wonderful vegetable and carrier oils that nature has to offer. 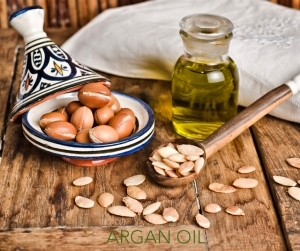 One of the most effective oils for locking in moisture and conditioning the hair is beautiful Argan Oil. There is a lot of hype about Argan Oil these days and not without reason. Argan Oil has many potential applications across skin and hair care but one of its most common uses is as an ideal leave in conditioner. There are many Argan Oil products on the market but our Argan Oil doesn't contain any chemicals or preservatives. The only adjustment we've made is to deodorise the oil (Argan Oil doesn’t have the nicest aroma in its original form!). So, if you’re looking to obtain, sleek, shiny and tangle free hair than this could be the oil for you! The intense conditioning and moisturising abilities offered by Argan Oil will help reduce attacks of the dreaded static hair. It’s better still when augmented by the addition of pure essential oils. Here is a simple hair mask recipe for you to try at home. Take 25ml Argan Oil – the most beneficial ingredient in Argan Oil is the presence of Vitamin E. Applying to the scalp will offer moisture and help restore dry skin (and in turn reduce the signs of dandruff). Argan Oil is thought to make the hair softer and sleeker. This will make your hair easier to brush and the added moisture should help to reduce those static attacks! Add 5 drops Ylang Ylang essential oil – often used as a natural conditioner, Ylang Ylang also promotes hair growth and is one of the most valuable oils for helping to induce relaxation due to its ability to slow down the heart rate. Relaxation is essential for our overall health and our hair is no exception to this; stress can have a direct impact upon both our skin and hair. Aromatherapy can help this by not only helping us to relax but the abundance of wonderful properties each oil contains can help keep our hair in great condition. There are other things you can do which will also help to avoid the build-up of static in your hair. Try using a wooden comb or brush and avoid using plastic ones. Try to avoid shampooing every day. And if your hair is completely out of control then you might consider using a humidifier in your bedroom. This will help to add moisture to your hair as you sleep.